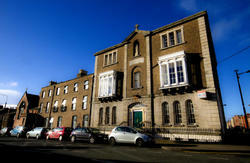 The Townhouse Hotel and Globetrotters Tourist Hostel are Award Winning Accommodation providers located in Gardiner Street Dublin, Dublin City Centre, Ireland. Gardiner Street Dublin is one of Dublinâ€™s best known Georgian Streets; Gardiner Street Dublin is historically, culturally, politically and architecturally important due to its unique history. Both the Townhouse Hotel and Globetrotters Tourist Hostel offer clean, comfortable and modern accommodation with FREE Wi-Fi available in all public areas and room types. We have daily tours leaving from our doorstep to such culturally and historically attractive locations as the Cliffs of Moher, Giants Causeway and so much more. Tourist Information Desk: We do not see our job as simply booking you into a room, and so we have provided a professional and dedicated front of house TEAM that manage our Tourist Information Desk 7 Days per-week. We also offer a FREE left-luggage facility and Safety deposit boxes are provided for a small charge. Our open plan breakfast area overlooks our wonderful Japanese Garden that offers a quiet Oasis for your morning coffee or afternoon quiet-time. Architecture/History: Both the Townhouse Hotel and Globetrotters Hostel are set within unique buildings that were designed and constructed by crafts-people of the Georgian era. While our buildings have been modernised and extended to meet with guest expectations, we have tastefully restored and maintained much of the buildings historical character. We pride ourselves in remembering our historic residents including the famous Mr Dion Boucicault and Lafcadio Hearne (Koizumi Yakumo), two famous poets and playwrights. 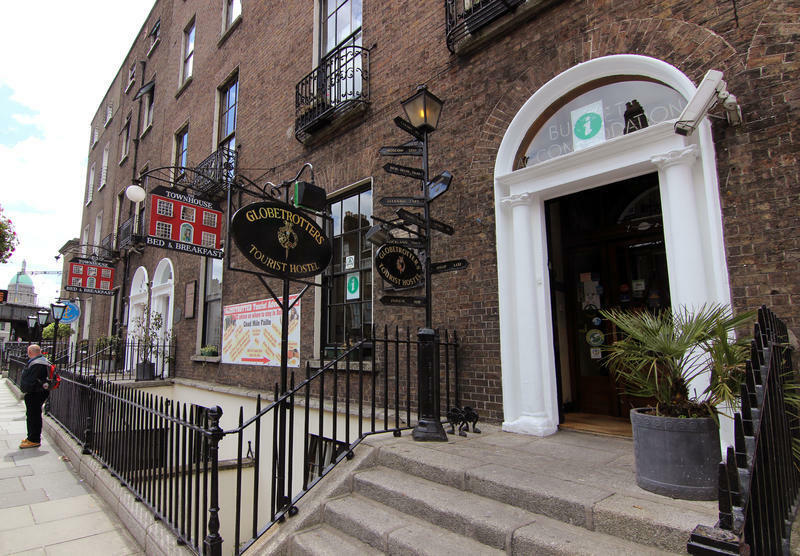 Location: The Townhouse Hotel and Globetrotters Tourist Hostel are centrally located and only a few minutes from all of the major tourist attractions, concert/sporting venues in Dublin. We are about 5 minutesâ€™ walk from Oâ€™Connell Street, 5 minutesâ€™ walk from the beautiful Custom House Quay, 10 minutesâ€™ walk from Temple Bar, we are 5 minutesâ€™ walk from the O2 Arena, Aviva Stadium and so much more. Room Types: In our Townhouse Hotel we have a range of room types including single, twin, double and triple. Our rooms are modern, clean and airy, allowing you to relax and enjoy your stay in Dublin. Some of our Triple rooms have a double and single bed. Globetrotters Tourist Hostel offers specially designed dorms that we have developed over many years to meet with guest expectations, we offer 6, 8, 10 and 12 bed dorms that provide a cosy and relaxing environment. The facilities offer in our dorms include FREE Wi-Fi, en-suite showers and toilet, fresh bed linen each day, soft feathered quilts. Self-service: We open the kitchen to our guests to allow them to cook their own meals between 3pm and 9pm. Transport: Close by the DART line crosses near the intersection with Beresford Place behind the Custom House and this is only a few minutesâ€™ walk from Connolly Station, and around the corner from Lower Gardiner Street is the Luas red-line stop at BusÃ¡ras (main bus station). The Airport Bus stops right outside our door. 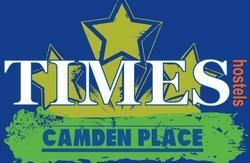 We also work with a taxi company that we can highly recommend. Health and Safety: Please note that children under 16 must be booked into private family rooms and are not permitted in shared accommodation. Take the Air Coach which will again leave you in O'Connell Street. Journey time approximately 25 minutes. Take the Air Link bus which will leave you at the main bus station. Walk back on to Gardiner Street (2 minutes). Journey time approximately 25 minutes. 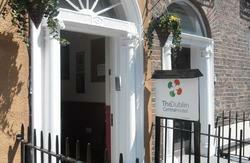 Take the number 41 bus to the terminus in Abbey Street and walk two minutes around the corner. Journey time approximately 35 minutes. Take the number 16A bus which will leave you in O'Connell street. Walk down Talbot Street and take a right, we are on the right. Journey time approximately 40 to 60 minutes.